During the regular season, there’s nothing better than Pens vs Flyer games. If you don’t think it’s the best rivalry in hockey, then you might as well just leave this blog right now. I know it’s not Original Six, but the hatred is real and strong. You can feel it in the air, and you can see it as soon as both teams hit the ice. 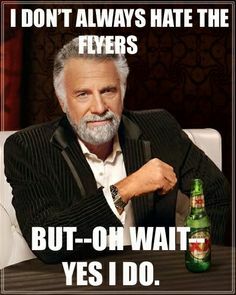 I don’t like anything about the Flyers. They are just filthy, greasy, dirty goons. And don’t even get me started on their fans. It doesn’t matter where you come from or where you end up — if you wear the orange and black at any give point in your career, I’m not going to like you. That goes for you too, Talbot. Sorry, superstar. With that being said, I’m not going to pretend that we haven’t choked a time or two because we let those filthy Flyers wind us up during rivalry games. It’s so easy for us to lose our cool with them and start playing Philly hockey. We never win when that happens. Tonight I’m so happy to see us playing our kind of hockey out there. This entry was posted in National Hockey League, Pittsburgh Penguins and tagged flyers, hockey, Penguins, rivalry games. Bookmark the permalink.